The successful completion of 3-day Krodikali Retreat at Chubjakha in Paro on 12th November 2017 marked another milestone in my spiritual life. After receiving the highest Krodikali initiation (Throema Wangchen) from His Holiness Garab Rinpoche last year, it gave me a great sense of accomplishment to attend the retreat for the second time this year. Starting from the evening of 9th November 2017, we all embarked on a unique spiritual journey closely guided by His Holiness Garab Rinpoche who supervised our practice throughout the retreat period. It gave us a special opportunity to take a short break from our routine life events and take out time to focus on our own inner self and explore beyond what our senses can perceive. As advised by Garab Rinpoche during the preaching, I personally felt blest to have got the opportunity to take out at least three days out of 365 days in a year to reflect on the true meaning of our existence and to take refuge in spiritual wisdom and practice that have emerged from the teachings of Lord Buddha. 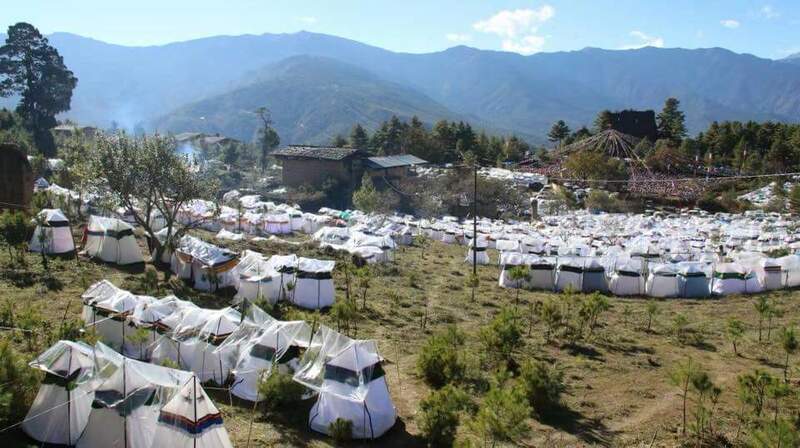 During the retreat, we were introduced to various important components of preliminary practice and other fundamental principles of Buddhism which we could practice in our tents through meditation. The special teachings administered by His Holiness Garab Rinpoche enlightened us on the special meaning and purpose of life and that gave us special reasons to practice Dharma in order to liberate ourselves and others from the world of suffering. Every day, we gathered at the ground at 06:00 in the morning for the prayer led by Rinpoche himself. Each session after the Morning Prayer was followed by special teachings and meditations. The idea was to help us understand the core philosophies of Buddhism both theoretically and practically. Personally, it left me with a completely unique experience and helped me reflect on the real meaning of human existence in this world. On the final day of the retreat, we were introduced to the basic concept and practice of Phowa, the art of transferring consciousness from one’s body at the time of death. We did the practice under the guidance of Rinpoche who took us through the entire process, one step at a time. When some people began to act wild probably due to some mistakes during the meditation process, I got scared because I didn’t want to be seen weird. But with the blessings of our Guru, I could complete the practice without any complication. I learned that if we keep on practicing Phowa, we would be able to transfer our consciousness from our head straight into the higher realm at the time of our death and that can significantly determine the type of life we are going to have after death. In the evening, a campfire was set up to celebrate the successful completion of the 3-day retreat. 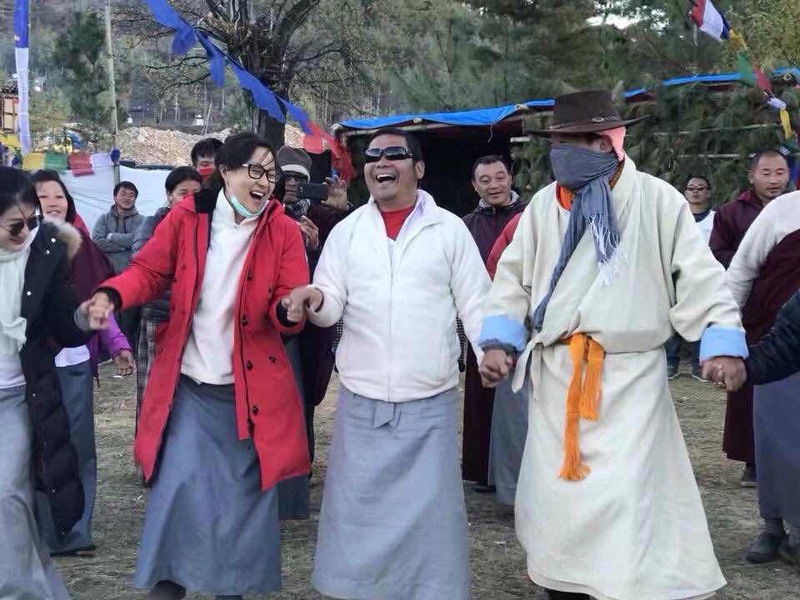 The entire atmosphere was filled with life and music as the crowd led by His Holiness Garab Rinpoche and his consort, Rinchen Paldon gathered around the fire to sing and dance together. Although I had been part of the crowd of Throema practitioners since last year, I had never got the opportunity to personally interact with Rinpoche. But this time, I was taken by surprise when Rinpoche and his consort invited me to dance with them, hand-in-hand around the campfire. Although I have never danced in my life, I truly felt blest to have got the opportunity to hold the hands of Rinpoche and his consort and move to and fro with them in rhythm of the song on the loud speaker. It was the happiest moment of my life because not everybody gets the opportunity to interact with such spiritual leaders like that. I was deeply touched and inspired when Rinpoche’s consort congratulated me on becoming a Throema practitioner despite being visually impaired. She gave me new strengths to continue my spiritual journey. I was so happy that I could join the rest of the fellow-practitioners in prayers and meditations without any difficulty this year. 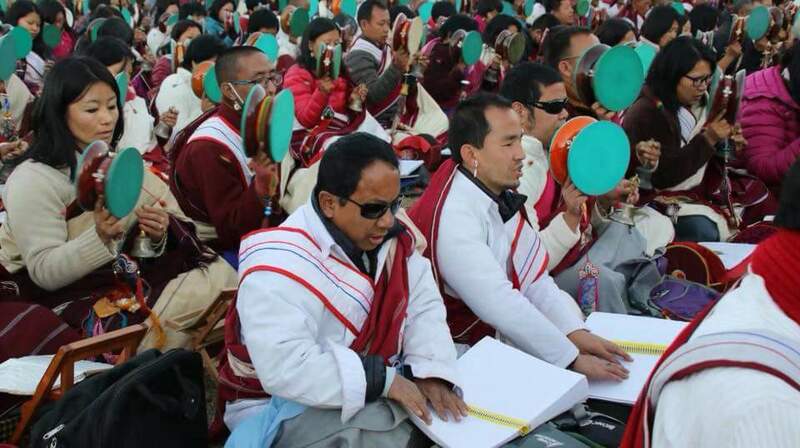 With most of the prayers committed to memory, even using the ritual instruments (drum and bell) during the routine prayers did not pose any problem for me this time. I could see a lot of progress in my practice, both in terms of practical and spiritual wisdom and with blessings from Rinpoche and my root Lama, I look forward to attaining greater levels of enlightenment as I move on.